On the evening of Thursday 10 October 2103 I’ll be chairing a panel of six esteemed lawyers, each of whom have contributed to Legal Cheek‘s popular ‘If I knew then what I know now’ series. I’ll be doing my best David Dimbleby impersonation to control the panel who will be speaking about how they made it to the top of the profession and answering questions from the audience. The event will take place at the Google Campus in Shoreditch, East London, starting at 6.30pm. 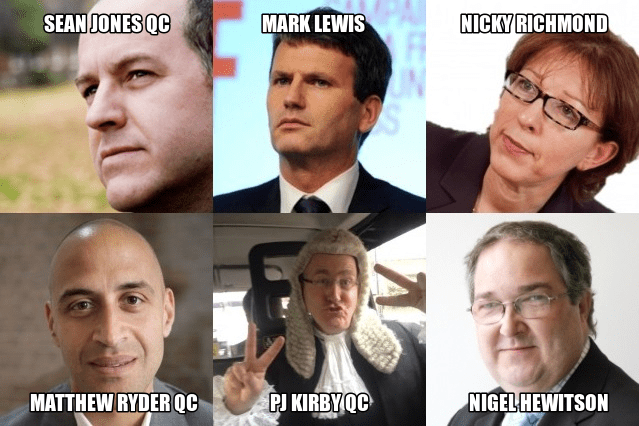 The speakers, pictured here, are employment and sports law specialist Sean Jones QC, phone-hacking lawyer Mark Lewis, Brecher managing partner Nicky Richmond, human rights silk Matthew Ryder, solicitor-turned-commercial barrister PJ Kirby QC and Norton Rose Fulbright head of planning law Nigel Hewitson. Further information can be found at Legal Cheek. To reserve a ticket, email events@legalcheek.com quoting ‘Event: If I knew’ in the subject line. Tags: Cheek, Event, Legal, Live. Bookmark the permalink.